The Air glove is a light breathable glove perfect for Fall, Spring, and Summer riding. Made of breathable Lycra mesh material on the back of the hand, your hands stay cool and comfortable. Silicone screen-printed graphic on the palm adds traction to your grip. These are sure to become your new favorite pair of gloves. How to Measure To find your perfect fit, measure the circumference of your hand using a cloth tape measure or a piece of string and a ruler. Use the chart above to determine the proper glove size for you. Great gloves, but they arnt very sturdy, once crash with gloves and I had holes in them. They finger grips come off really easily after a few rides. But they did fit very well I was impressed with the fitment. Just weren't sturdy enough for me. The gold standard in mountain biking gloves! No frills, no bullsh#* just quality & a name that you can trust. Very good fitting gloves. Material feels tough but I don't know how they'll hold up over time. They have just enough padding in the glove to provide protection without feeling bulky. Very bright color should be easy to spot if I accidently leave them on a picnic table or something. Light summer glove. Keeps my grip while soaked in sweat. Hard to go wrong here, great gloves. These gloves are comfortable and grippy. They have survived a couple trees and rocks so far and protected my fingers well. true to size. Exactly as pictured. Very good quality. Comfortable fit. Gloves feel great and fit like a second skin. Also love the bright yellow. why would you buy other gloves? there really isn't competing with these. good fit, good finish, durable. Smokin deal on these sweet globes. Fit is snug and small usually wear large but these in medium fit nice. Great feel on bike. Excellent grip and the bright color gets the attention of drivers who aren’t paying attention. At it does when giving them the bird. 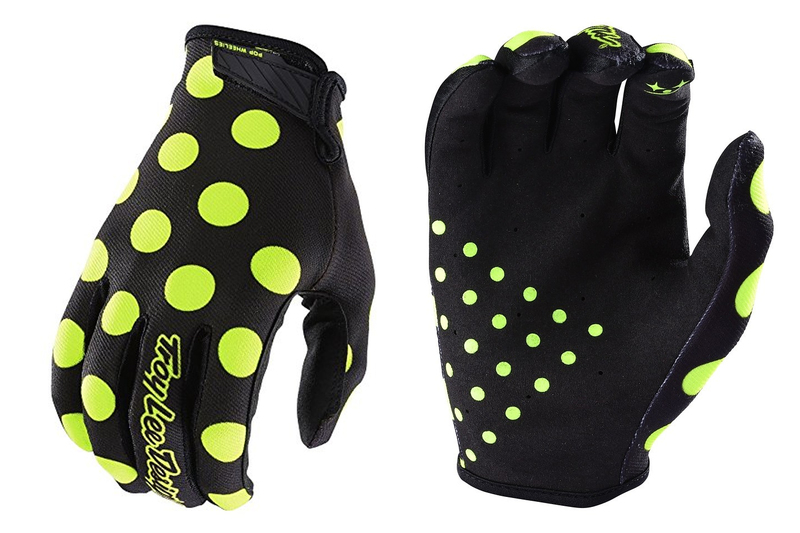 These gloves are great for those who want to wear a full-fingered glove in warmer months. They aren’t super durable, but feel really good on your hands & give excellent tactile control. These are my favorite gloves for everything other than really cold weather. They feel light and the palms and finger areas are tacky without being sticky. They are good to about 50ish degrees or so. Below that they dont quite keep the hands that warm. I have them in almost every color at this point. Pink, Orange, Green and Blue. Excellent price point excellent product-and this is why I keep coming back to Jensens boys and girls!! Because they are the Sh*t and always meet my needs!!! Very nice glove. Already lasting way longer than other brands I've used. The TLD's are my current glove of choice. I got the black ones with high-vis polka dots. They feel great and come with the velcro strap. Secure nicely and fit well. Glove fits great and is very breathable. Rode in 80 degree weather without feeling like my hands were in a sauna. Tried these out since they were on sale and found them to be well vented and the palms/fingers grip the bars and levers really well. These gloves have proven to be very well engineered and appear, with 10 months of use, to be extremely durable and comfortable. Used mainly for long techical climbs and steep rocky decents. sizes are listed as med/s. fits more like a medium. nice glove. vents well. and you won't lose them. Fit my hands perfectly, light, no discomfort on the seams... Good simple deisgn. Have always been a fan of TLD gloves and these appear to be another good buy, especially on sale. My only quibble is that this model lacks a microfiber nose wipe on the thumbs. Otherwise they would get five stars. Good gloves for the price but I'll put these on commuting duty, not racing. Fit is fine, but hands shift around inside the glove on the palm area. These gloves breathe well and have good grip. They're comfortable enough to wear for several hours. They allow me to control my iPhone as well, which is important for controlling my music. These gloves are great overall, super stylish and fun. Have gotten a ton of compliments on them and for $11 i got them on a freakin steal! No cushy gel like my Fox Ranger half fingers but the TLD's have a nice grip and have been super comfy on the first few rides, definitely recommend if you're looking for a light trail glove and want to score some style points at the same time. I wear a medium in most other gloves and these run a little small. Seems on end of fingers did under my finger nails. Do you actually know the definition of "fourchettes"? BEST ANSWER: This is a glove seamstress term which means a forked strip of material forming the sides of two adjacent fingers of a glove.